You know the saying “Spring ahead, fall back?”. Well, tomorrow, November 4th, is the day that we need to fall back. That’s right, Daylight Savings Time is over, which means when we wake up, we will have gained an extra hour so hopefully you’ll take advantage and grab that extra hour of sleep we so often want. This year, let’s add a new saying to our proverbial repertoire – “Change Your Clock Change Your Battery”. 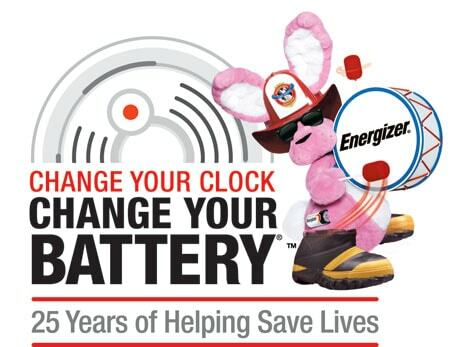 As we’re changing our clocks, Energizer and the International Association of Fire Chiefs (IAFC) want to encourage us to also take the important, potentially life-saving, step of changing the batteries in our smoke alarms and carbon monoxide detectors. 24 percent of fatal fire injuries occur in homes where there is at least one smoke alarm that failed to operate, often because the smoke alarm had dead or missing batteries. That’s way too many fatalities that could have been prevented just by changing a battery. 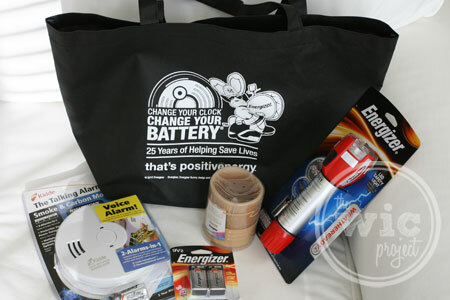 To help give more families those critical seconds, Energizer is honoring its 25th year by donating 250,000 batteries to fire departments across the country to distribute to local families in their areas and adopting 25 fire departments in 25 cities across the nation, who, in addition to batteries, will be equipped with a variety Energizer® family safety products for their department and to share in their communities. For more information on how you can keep your family safe, visit the Energizer Bunny Facebook page and click on the Fire Safety Info Tab. Not only will you find fire safety tips, a grid to help plan your home’s escape plan, and coloring and activity sheets for the kids, but you can also enter to win a Family Safety Kit, valued at more than $150. Tomorrow, as we say “Goodbye” to Daylight Savings Time, let’s say “Hello” to keeping our family safe and prepared in case of fire. When you change your clocks, change the batteries in your smoke alarms and carbon monoxide detectors. I make sure to have plenty of food and supplies in the house in case of an power outage or bad weather. Make a plan, also go to a basement in storms. We have a plan in case of fire or those happenings. make sure you change the batteries in the smoke detectors regularly. We have smoke and fire and CO2 detectors! We have a security alarm with the smoke and carbon monoxide detectors linked in with it! We have two fire extinguisher in the house. Make sure to change the batteries in the smoke alarms, always have bottled water and a first aid kit onhand! I deal with Hurricanes a Lot,so I keep extra water,canned goods,have a generator and have plenty of batteries on hand! Emergency supplies in house & in car. We practice fire drills and make sure our smoke detectors are working correctly. We have smoke detectors, first aid kits, lots of extra batteries and flashlights/lanterns if the lights go out, and lots of canned goods/bottled water. We change our batteries when we change the clocks. We have smoke detectors and I change batteries ever year on New Years Day and we also do LOTS of talking to my grandson about fires, etc. Arm system, smoke detectors, a good gaurd dog. We have a safety inspector come every year to check our home for fire hazards and to see if our smoke detectors are working properly. We check our fire detectors often, we are pretty strick with them concerning water, fire and stuff like that. And we always lock our doors! Each one of us has 2 dogs that we are responsible for if something happens. We make sure we have a spot to meet outside. We have smoke detectors throughout our home and an evacuation plan in case of an emergency. We make sure we have wroking carbon monoxide and smoke detectors and have regular checkups on our gas heating systems. I have smoke detectors in every room, I have a carbon dioxide detector. I also have a fire extinguisher in the kitchen,all to keep my family safe. We have a “safety zone” and a exit route. During daylight savings time I always make sure I change all the batteries in the house. I always check all the doors and windows before going to bed. We have a room in the house to go to in case of weather emergencies. It has supplies in it. We have a emergency plan and kit and we talk to our kids about what to do if there is a fire. Would be nice to have these as back ups in case of power outage. I have a first aid kit, candles/batteries, and everyone knows what to do in an emergency. We have all wall plugs covered, smoke detector in all rooms, latches on all cabinets and all cleaning products are kept up high. I always have supplies on hand. I make sure we have carbon and smoke detectors in every hallway of our home and change the batteries regularly. We have a smoke detector, fire extinguisher, safet locks on medicine cabinets & dangerous products locked in a cabinet in the storage shed, which is also locked. We have smoke detectors, carbon monoxide detector, fire extinguishers, and a fire safety plan. We have batteries, lots of candles, battery operated radio, first aid kits, smoke detectors, and carbon monoxide detectors. My boyfriend is in charge of safety…but I’m buying renters insurance, and we have a lot of water and batteries. I have batteries, candles, smoke detectors, fire extinguisher, crank flashlight, etc. I have working detectors in the home. Keep my doors locked, have led lanterns so no need for matches, have RX meds in one place so they can be grabbed easily. educate my soon to be 5 year old about safety. check the detectors in the house, keep things working well. We have flashlights, lanterns and batteries, along with a smoke detector. We have an alarm and fire alarms too.Thanks for the chance. Be hurricane ready with flashlights, candles, batteries, canned goods, water, etc. I keep candles, matches, batteries, flashlights, first aid supplies, canned goods, etc. on hand. We keep our home secure, have working smoke and Carbon monoxide detectors, clean out drier vents, etc. I unplug appliances when leaving the house. Make sure nothing obstructs escape routes. We have a stockpile of supplies and canned foods. make sure the smoke alarms work, and make sure everyone knows the fire exits. We live in an area with earthquakes so we all have a 72 second kit as well as a 72 hour kit for each of us! I keep my family safe by teaching my children about fire safety, and keeping our fire alarms working and an emergency supply kit on hand. We have smoke detectors, flash lights, candles and batteries! We always have supplies on hand in case of an emergency! make sure our doors, windows are locked every night and change the batteries in our smoke alarm. we also have a safety route to get out of the house if we need too. I check all the doors before I go to bed, and then make sure that their curtains are closed and lights are off because my kiddos’ rooms are on the front of the house, and I don’t want anyone to be able to peek in on them. That part might sound a little anxious, but you never know!! Changing the batteries in smoke detectors. I check the smoke detector batteries regularly. Go over fire safety and have emergency supplies on hand. Having just been through Hurricane Sandy, we know now more then ever the importance of having supplies on hand at all times. I do have 1 smoke detector and I have 3 fire extinguishers in the house. We have practice fire drills to help teach the little ones what to do in case of a fire. Being mindful of our surroundings…doors and window locked, smoke detectors, keep dryer clean & clear of lint. I always talk about ways to be safe with my kids. We have smoke detectors and carbon monoxide detectors. We also change the batteries regularly. We have smoke detectors and an emergency evacuation plan. we teach the kids about 911 phone calls! burglar, fire, carbon monoxide alarms. Have an escape plan and keep the batteries in the smoke detector fresh. Thanks for the giveaway. We make sure everyone knows our escape plan. We have smoke detectors and carbon monoxide alarms. we keep prepared for anything. Smoke detectors, emergency plan, gallons of water, batteries and food. We have a safety plan for evacuation and I change the smoke and CO2 detectors twice a year. We have an emergency kit. We go over the steps to take in an emergency. It’s important to drill at least once. We have smoke detectors, carbon monoxide detectors, fire extinguishers and an escape plan. Smoke detector, fire extinguisher and an escape plan if the door is blocked. Also try to keep my cell phone near me, just in case. We have smoke detectors, extra batteries and bottled water on hand, thanks! We have 4 smoke detectors, 2 carbon monoxide detectors & 2 fire extinguishers in the house & garage. We have smoke alarms in the house. We have smoke alarms and we check them regularly to make sure they work. We made a family emergency plan! smoke alarms & 4 dogs helps make us safe, lol. Smoke detectors, first aid kit in car, light hallway at night. We have smoke detectors in the hallways. I make sure the batteries in my smoke alarm work. We have a family evacuation route from our home that we practice in case of a fire. We have an exit plan in case of emergencies. We discuss exit/emergency plans often and go over drills. Daddy is a Firefighter so safety is a big deal here with practicing drills and plans often! We have an exit plan in case of fire. we regularly check our smoke detectors work. Make sure the alarms have batteries and we have an escape route. We do a house check before we leave. That includes making sure that the back door is locked and the straightener is unplugged. Smoke alarms. Everyone is taught how to exit out any window. I am OCD about never leaving the house with Anything on except an alarm clock. ..no lights, crockpot, stove, tvs ..zero everything must be off when we are not home. We have lots of alarms around the house and make sure fresh batteries are always in ’em. Thanks for the giveaway…we test our alarms each month, and have a family escape plan in case of fire. Smoke alarms and practice drills.